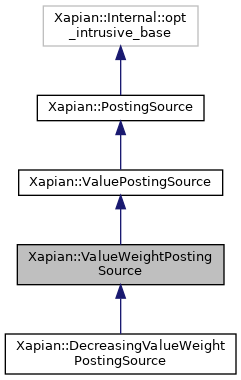 The upper bound on the weight returned is set using the upper bound on the values in the specified slot, or DBL_MAX if value bounds aren't supported by the current backend. For efficiency, this posting source doesn't check that the stored values are valid in any way, so it will never raise an exception due to invalid stored values. In particular, it doesn't ensure that the unserialised values are positive, which is a requirement for weights. The behaviour if the slot contains values which unserialise to negative values is undefined.